We are offering Botany Cabinet to our clients. These are Botany Cabinet with 3 drawers containing 14 leaf shapes. The shapes are green in colour placed within yellow insets. Botany Cabinet consists of A Beech wood polished and well finished cabinet with 3 drawers containing 14 leaf shape insets and frames. 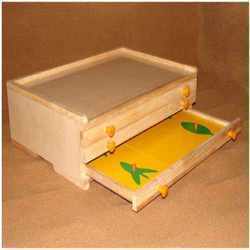 Frames are painted with Yellow colour & Insets are Painted with Green Colour to Introduce botany and botanical name to the child. Cabinet fabricated out of thick board and is clad externally in mica lamination sheet with lockable door. Drawers joints are tongs & groove type having 16 compartments each of 4 x 4 x 2" to store~ 32 blocks of 1 x 1" in two layers. Each drawer has two puller knobs. 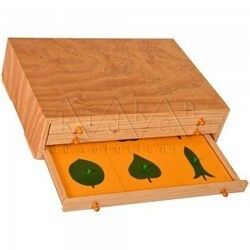 A teak finish cabinet with 3 drawers containing 14 leaf shape insets and frames.